When it comes to your dishwasher, you may be thinking that it gets a good cleaning every time it tackles your dirty dishes. Unfortunately, that’s not the case. Like everything else in your home, you need to clean your dishwasher on a regular basis to keep it sparkling clean, effective, and odor free. Learn how to clean a dishwasher with these cleaning tips and recipes for all-natural homemade cleaning solutions. You might think it strange to have to worry about cleaning the dishwasher, but like the other appliances in your kitchen, you need to clean them on a regular basis. That’s because the interior of your dishwasher, especially the crevices and corners, actually accumulate food debris, grease, and soap scum every time you clean your dishes. Not only does this make the inside of your dishwasher look bad, but it will eventually make your dishwasher smell. Keeping your dishwasher clean doesn’t take much effort to keep it looking new and running efficiently. Over time, your dishwasher collects food particles, soap residue, and other gunk that needs to be addressed to ensure you continue to have clean dishes after every cycle. Cleaning a dishwasher is more than merely running hot water through the machine, properly cleaning it entails digging in and getting your hands dirty. Here’s how to clean a dishwasher with vinegar and other everyday household products. Before you can begin to clean the tub of the dishwasher, you’ll need to clean out any debris from the inside. Using a handful of paper towels and grab any food particles and debris from the base. You’ll find a majority of the debris around the drain, which can create those unwanted dishwasher smells. After you’ve cleared the debris, run a wash cycle, with nothing in the dishwasher. You can use a DIY dishwasher cleaner, like the one below, or you can clean it with vinegar. To clean the dishwasher with white vinegar, pour the white vinegar into a dishwasher-safe cup and place it on the top rack. Then run a complete cycle using the hottest water possible to help disinfect the unit. After the cycle finishes, use a paper towel or clean cloth to wipe down the inside of the dishwasher. In a small bowl, combine the baking soda and hydrogen peroxide, mixing until it has the consistency of damp sand. Using a large spoon, scoop out enough mixture to form large balls. Place the balls in the dishwasher overnight. The next day, fill a glass with the vinegar and dishwashing detergent, adding the essential oils if using, and place the glass on the top rack of the dishwasher, along with another ball of the hydrogen peroxide and baking soda on the bottom rack. Run the dishwasher on its hottest setting to allow the cleaner to clean the dishwasher effectively. This is a great recipe for a DIY dishwasher detergent without Borax. If your dishwasher stinks, you’ll want to wash the accessories and parts of the dishwasher. Take out the bottom rack, and top rack if it can be removed, as well as the utensil holders. Wipe off any stuck-on food particles and other debris with a paper towel or damp cloth. Use an all-purpose cleaner, like the one featured below, to wipe down and disinfect the parts. Use a toothbrush or soft brush to scrub the spray arm to remove any clogs, which can result in your dishwasher not cleaning properly. Dishwasher filters vary greatly, so you’ll want to refer to your owner’s manual for specific directions on how to clean the screen in your dishwasher. Here’s how to clean a dishwasher filter if it can be removed. Take the filter out of the dishwasher and rinse it under hot running water to remove debris and food particles. Using a damp paper towel, clean the area beneath the filter, then put it back in place. This easy-to-make all-purpose cleaning recipe works not just to clean your dishwasher but also all main appliances around your house. It allows to grease off and clean a dirty oven the same way as it makes an old washing machine, dryer or fridge shine again. Put the baking soda into the spray bottle, then fill the bottle with water. Replace the lid and shake the bottle to completely dissolve the baking soda. Remove the top and add the castile soap to the mixture. Replace the cap and gently swish the bottle in circles to gently combine the ingredients. Spray the mixture directly onto the surface and wipe clean. You may have mineral or rust stains inside your dishwasher depending on the state of your pipes and your water source. Add a product that is designed to remove rust from clothes and appliances to the soap dispenser cup of the dishwasher and sprinkle a generous amount on the bottom of the dishwasher. Then, run the empty dishwasher through a complete cycle. For tougher rusty spots make sure you check out our special rust stains removal tips. Depending on the water in your home, your dishwasher could have hard water deposits or mineral build-up on the inside. Use can use lemon juice to tackle these problems. Add some lemon juice to a dishwasher-safe container and place it on the top rack of the dishwasher and run a regular cycle. The acid from the lemon juice will work to remove iron build-up and hard water spots inside the dishwasher. Lemon juice is the perfect home remedy to clean an iron or any appliances with hard water stains. The door of your dishwasher can quickly become covered in unsightly fingerprints, especially if you have a stainless steel dishwasher. You can keep the stainless steel door fingerprint free by wiping it down with warm, soapy water, or a homemade stainless steel cleaning solution, like the one below. You want to avoid harsh detergents and abrasive scouring pads that might scratch the finish on the dishwasher. After the door is clean, wipe it down with a dry, soft cloth. If you have tricky fingerprints, you can tackle them with a bit of rubbing alcohol and a soft cloth. Once the outside of the door is clean, it’s time to tackle the inside. Open the door so you can clean the tops and sides. With an old toothbrush, scrub around the door with hot, soapy water, being sure to get in the grooves of the rubber seal and other crevices. If there is a lot of build-ups, you may need to use a slightly abrasive cleaner to remove the gunk. Use a sponge, dipped in hot soapy water to wipe away any result grime. With a clean, wet sponge, wipe away any residue left behind by the cleaning solution. Pour the hot water, vinegar, and baking soda into a spray bottle. Once the foaming subsides, replace the lid of the spray bottle. Spray the cleaner onto the stainless-steel appliance you’re cleaning. With a clean, dry cloth, wipe off the solution following the grain of the steel. To prevent streaking, be sure to dry the surface with a dry towel thoroughly. If you’ve discovered that you have a smelly dishwasher, then it may be time for you to take the time to clean it. Cleaning a dishwasher shouldn’t be a chore. 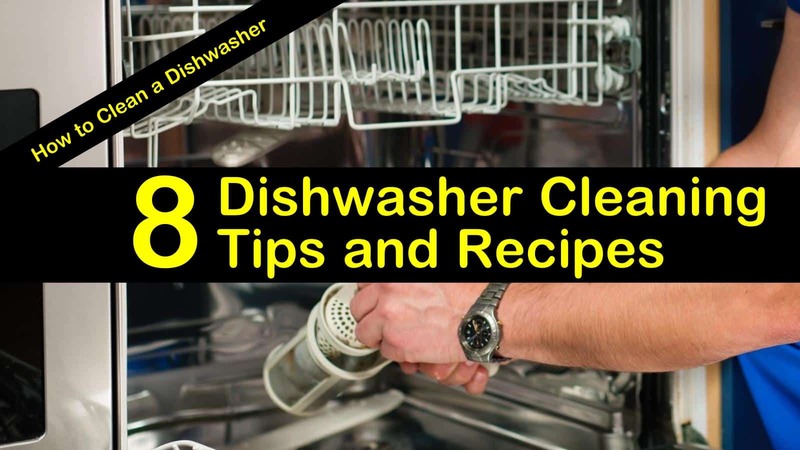 With these simple tips and easy to make homemade cleaning recipes, using the cleaning power of vinegar and baking soda, you can have a clean dishwasher that runs more efficiently and smells better. 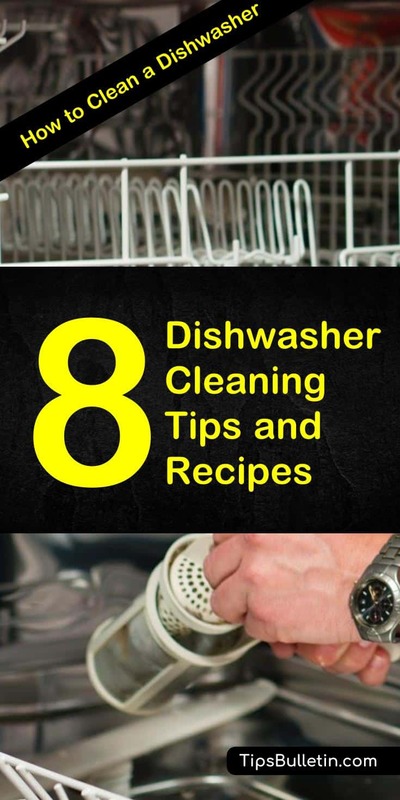 We hope you enjoyed learning how to clean a dishwasher using simple techniques. If you found the information in this article useful, we hope you’ll share it with all your friends and family.